Commit to drinking more water! There are so many health benefits to drinking water and it’s so easy so free yet so overlooked. Water makes up about 60% of the body there for you need water to function properly. We begin to show signs of early dehydration (thirst, dry mouth, fatigue, headache, etc.) as soon as that figure begins to drop. Your brain alone is actually 90% water!! The amount of water each individual needs is different but some suggest 8 (8oz) glasses a day. While your activity level, environment (temperature and humidity), and diet (including other beverages) all affect your required intake but if your urine isn’t mostly clear or you have any of the symptoms mentioned above, you most likely aren’t getting enough H2O. I find it helpful to fill a 1-liter container that I can use throughout the day to better monitor my intake. Seeing that container go down motivates me to keep drinking! The visual goal really helps. If you don’t care for the taste of……nothing, then try adding slices of citrus fruit (lemon, lime, or orange), cucumber, pineapple, or even mint leaves if you need a hint of flavor. Like any new lifestyle change, it is best to start small: if you aren’t drinking any water, try for just a glass in the morning and one in the afternoon; gradually increase your intake each day. Check out some of the Benefits of Drinking Water: Don’t Medicate, Hydrate! 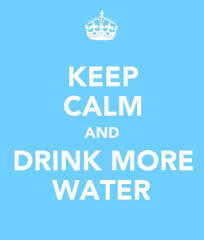 Increases Energy & Relieves Fatigue- Our brain is 90% H20 so drinking it helps you think, focus and concentrate. Promotes Weight Loss- Removes by-products of fat, reduces hunger, raises metabolism and zero calories! Detoxifies-by flushing our toxins through sweat and urine. Improves Skin Complexion- Best Anti-aging treatment around! Natural Headache Remedy- Headaches are commonly caused by dehydration. Prevents Muscle Aches & Cramps by lubricating the tissues to become more elastic. Puts you in good mood because your body is functioning at it’s best! Save you money$ Water is free!! After a Massage Therapy Treatment you will often hear us say “Drink plenty of water” this is to help flush and remove the waste and lactic acid build up that is released in the tight muscles through out the massage. When you drink plenty of water after a treatment you help this process and it prevents excessive stiffness or sore muscles 48 hours after a treatment. *Avoid storing your water in plastic containers due to the dangers of BPA– Stainless steel or glass is best; be sure to regularly wash reusable bottles.